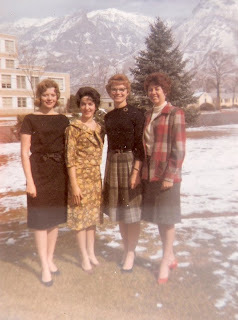 This is a photo of my Mother-in-law with her roommates at BYU. Yes, my Mother-in law is the pretty one in the "perfect black dress." The dress I want for Dan's graduation. Oh, how I wish I could find that very same dress and look just as glamorous as she does in this photo. Katherine, I loved the photo's you posted. They are treasures. You would look great in it. We need to find a seamstress for you. I bet that dress could be recreated fairly easily. But then again, I'm so far from being a seamstress---what do I know? That would be so cool though if you had the same dress. I would love that. That is a great dress - can y0ou find someone who sews to help you make it?